Rich Higgins was born on January 15, 1945, in Danville, Kentucky. He entered the Navy ROTC program at Miami University in Oxford, Ohio, on April 19, 1963, and was commissioned a 2d Lt in the U.S. Marine Corps in May 1967. After completing the Infantry Officers Basic Course at MCB Quantico, Virginia, Lt Higgins served as a Rifle Platoon Commander and Rifle Company Executive Officer with C Company, 1st Battalion of the 3d Marine Regiment in South Vietnam from December 1967 to July 1968, followed by service as aide-de-camp to the Assistant Division Commander of the 3d Marine Division in South Vietnam from July to August 1968. His next assignment was as Assistant Protocol Officer of the 3d Marine Amphibious Force in South Vietnam from August 1968 until he returned to the United States in December 1968. Capt Higgins served as Assistant Joint Chiefs of Staff Librarian at Headquarters U.S. Marine Corps from January to July 1969, and then as Officer in Charge, Marine Corps Officer Selection Team, at Louisville, Kentucky, from July 1969 to August 1971. After completing the U.S. Army Infantry Officers Advanced Course and Nuclear Weapons Target Analyst Course at the U.S. Army Infantry School, and then the Military Advisor Course at the John F. Kennedy Institute for Military Assistance, Capt Higgins served as an Infantry Battalion Advisor to the Republic of Vietnam Marine Corps in South Vietnam from September 1972 to August 1973. His next assignment was as a Rifle Company Commander with B Company, 1st Battalion, 4th Marine Regiment on Okinawa from August to December 1973, followed by service as Operations and Academics Officer, Law Instructor, and Assistant Director of the Staff Noncommissioned Officers Academy at MCB Quantico from January 1974 to 1977. During this time he also served as Operations Officer for the Platoon Leaders Class at the Officers Candidate School at Quantico. 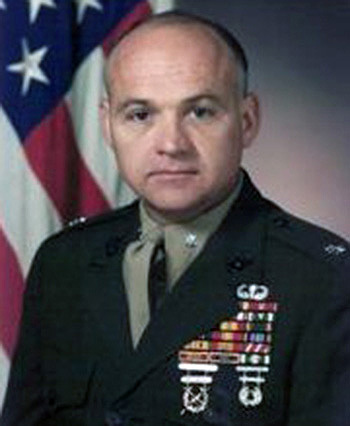 Maj Higgins served as a Rifle Company Commander with A Company, 1st Battalion of the 2d Marine Regiment at Camp Lejeune, North Carolina, from 1977 to 1978, and then as Logistics Officer for Regimental Landing Team-2 with the 4th Marine Amphibious Brigade at Camp Lejeune from 1978 to 1979. He next attended Air Force Command and Staff College at Maxwell AFB, Alabama, from 1979 to 1980, followed by service as a Plans Officer with the Service Plans and Policies Division at Headquarters U.S. Marine Corps at the Pentagon from 1980 to 1981. From 1981 to 1982, Lt Col Higgins served as Military Assistant to the Special Assistant to the Secretary of Defense, and then as Assistant for Interagency Matters to the Executive Secretary to the Secretary and Deputy Secretary of Defense from 1982 to 1984. He attended the National War College in Washington, D.C., from May 1984 to May 1985, and then served as Military Assistant to the Secretary of Defense from May 1985 to June 1987. His final assignment was as Chief, Observer Group Lebanon, and as Senior Military Observer, United States Military Observer Group, United Nations Truce Supervision Organization, from July 1987 until he was captured by Muslim terrorists in Lebanon on February 17, 1988. Lt Col Higgins was promoted to Colonel while in captivity on March 1, 1989, and was believed to have been executed on July 31, 1989, although he was not officially declared dead until July 6, 1990. After his remains were recovered in Beirut on December 23, 1991, Col Higgins was buried at Quantico National Cemetery on December 30, 1991. The guided missile destroyer USS Higgins (DDG-76) was named in his honor. On March 18, 1992, President George H.W. Bush awarded Col Higgins the Presidential Citizens Medal, and he was posthumously authorized the Prisoner of War Medal in April 2003. For heroic achievement in connection with operations against the enemy in the Republic of Vietnam while serving as a Platoon Commander with Company C, First Battalion, Third Marines, Third Marine Division. On 19 January 1968, Second Lieutenant HIGGINS led his platoon to relieve another platoon from Company C which was under enemy fire from three sides and was in danger of being overrun. Upon reaching the battle area, he aggressively led his platoon in an assault through a bunker complex along the right side of the enemy positions. Boldly advancing through enemy 60mm mortar fire, he moved his platoon forward into the enemy fortifications and repeatedly exposed himself to hostile fire as he directed and encouraged his men in systematically destroying numerous positions within the bunker complex. In more than five hours of heavy fighting, his unit accounted for eleven enemy confirmed and eight probable killed and captured four enemy weapons. Second Lieutenant HIGGINS' courageous actions, bold initiative and selfless devotion to duty at great personal risk undoubtedly prevented the North Vietnamese from overrunning the beleaguered platoon and were in keeping with the highest traditions of the Marine Corps and of the United States Naval Service. Second Lieutenant HIGGINS is authorized to wear the Combat "V".